This file contains a static class for accessing functions to generate and execute semantic queries and to serialise their results. Markus Krötzsch Static class for accessing functions to generate and execute semantic queries and to serialise their results. Add the subject print request, unless mainlabel is set to "-". Parse a query string given in SMW's query language to create an SMWQuery. Parameters are given as key-value-pairs in the given array. The parameter $context defines in what context the query is used, which affects ceretain general settings. An object of type SMWQuery is returned. The format string is used to specify the output format if already known. Otherwise it will be determined from the parameters when needed. This parameter is just for optimisation in a common case. Preprocess a query as given by an array of parameters as is typically produced by the #ask parser function or by Special:Ask. The parsing results in a querystring, an array of additional parameters, and an array of additional SMWPrintRequest objects, which are returned in an array with three components. If $showMode is true then the input will be processed as if for #show. This uses a slightly different way to get the query, and different default labels (empty) for additional print requests. Returns the definitions of all parameters supported by the specified format. Produces a list of default allowed parameters for a result printer. Most query printers should override this function. Takes an array of unprocessed parameters, processes them using Validator, and returns them. 1.6.2 The return value changed in SMW 1.8 from an array with result values to an array with Param objects. Process and answer a query as given by an array of parameters as is typically produced by the #ask parser function. The parameter $context defines in what context the query is used, which affects certain general settings. The main task of this function is to preprocess the raw parameters to obtain actual parameters, printout requests, and the query string for further processing. boolean $showMode process like #show parser function? Process and answer a query as given by an array of parameters as is typically produced by the #ask parser function. The result is formatted according to the specified $outputformat. The parameter $context defines in what context the query is used, which affects ceretain general settings. Consider using getQueryAndParamsFromFunctionParams() and getResultFromQuery() instead. Create a fully formatted result string from a query and its parameters. The method takes care of processing various types of query result. Most cases are handled by printers, but counting and debugging uses special code. Process a query string in SMW's query language and return a formatted result set as specified by $outputmode. A parameter array of key-value-pairs constrains the query and determines the serialisation mode for results. The parameter $context defines in what context the query is used, which affects certain general settings. Finally, $extraprintouts supplies additional printout requests for the query results. Find suitable SMWResultPrinter for the given format. The context in which the query is to be used determines some basic settings of the returned printer object. 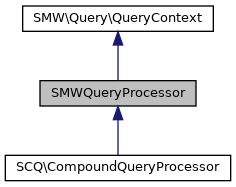 Possible contexts are SMWQueryProcessor::SPECIAL_PAGE, SMWQueryProcessor::INLINE_QUERY, SMWQueryProcessor::CONCEPT_DESC.